A Shift is an allotted schedule booked in which the Runner(s) delivers groups of jobs for the same Sender. The Sender or Go People Admin can book a Shift. A Shift begins with an ‘S’ and has 12 digits with a dash between the 9th and 10th digit, e.g. #S123456789-1234. 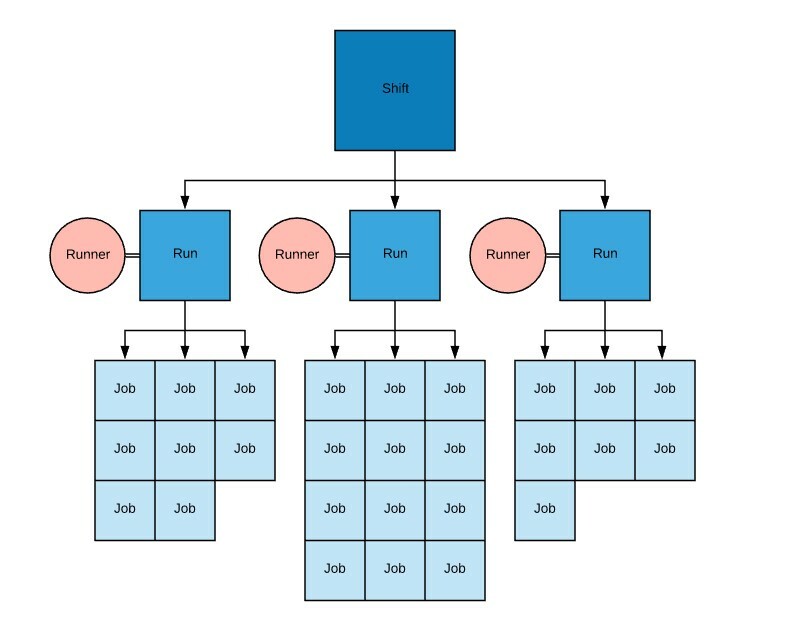 A Run is a group of jobs that has been put together by either the Sender, our system or our Operations team. It may include several jobs from the same Sender. A Runner is allocated to a Run. A Run reference starts with a hash #, followed by an ‘R’ and has 12 digits with a dash between the 9th & 10th digit, e.g. #R123456789-1234. A Job is a delivery that a Sender has booked on our platform. The Runner collects the delivery from the Sender at the pick-up location and delivers it to the Recipient at the drop-off location. A job reference starts with a hash #, followed by 12 digits with a dash between the 9th and 10th digit, e.g. #123456789-1234. This is usually the number that Customer Service ask you to give when you need help with a delivery. A Job or many Jobs can be put together in a Run. A Sender may book one or several jobs via the Go People platform. The graph below shows the relationship between Shifts, Runs, and Jobs. In this example, there is 1 Shift, consisting of 3 Runs. This Shift has 27 Jobs.